No one really knows the battles that individuals go through. It is important to understand that people struggle and it’s not always easy to identify the signs of an unhealthy way of thinking; everyday, there are 123 suicides across the country (AFSP). The Crisis Text Line, similar to the Suicide Hotline, was founded in August of 2013 by Nancy Lublin and Bob Filbin and has since received 85,360,177 messages from all over the country. According to the Crisis Text Line website, it was founded to empower journalists, researchers, school administrators, parents, and all citizens to understand the crises their communities face so they can work together to prevent future crises. It’s a place where people can call or text someone to talk to them about issues going on in their lives. Calls or messages to the crisis line deal with a variety of issues ranging from relationships (#1) to a third party (#14) according to their website, but regardless of the issue all are saying the same thing: they need help. 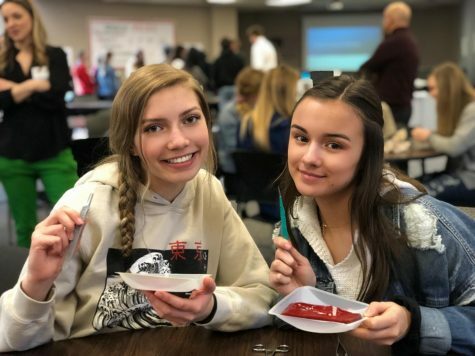 Westerville South’s social worker Noelle Spriestersbach said, “…being there is a powerful thing.” Students normally look past the signs that their friends are depressed or are having suicidal thoughts, but the best thing for them to do is to be there, not trying to ‘fix it’ she said. According to Spriestersbach, don’t try to be the therapist, but know when to go to adults if it gets out of hand. Most people are impacted, by some degree, by suicide; for every suicide there are 25 people who attempt afterwards. A friend or family member lost to suicide is a despairing thing to undergo, which is why it is important to be there for each other in one’s time of need. Statistically, Ohio has the 31st highest suicide rate in the country, with one death happening every five hours according to the AFSP, the American Foundation for Suicide Prevention. It is the second leading cause of death for people between the ages of 15-34; with males accounting for 7 of 10 of deaths in the United States. For every death, 11.4% of people had been hospitalized due to non-fatal self-harm wounds earlier in their lives (AFSP). Those who know the signs of suicide and depression need to talk to their friends and be there for them when they need it the most. Those who don’t, there are the basic signs for recognizing depression. When someone normally isolates themselves and tends to talk about death or harming themselves, this is the appropriate time to contact a trusted adult and get them to step in, as these are signs of suicidal thoughts or actions. Many students often experience anxiety, but, there are many resources at South that are available to help them. Mrs. Noelle is available to students if they want to talk about something in a safe environment, and the counselors are also available to talk about problems. Students have the power to help someone off of the ledge that could ultimately cause them to take their own life. Comforting them or simply being there is enough to brighten one’s day, to make them feel better about what’s going on in their lives.